The summer holidays are over and the rabit has gone back to work. I am quite relieved because he has been constantly fussing about on our field for two months, sawing, hammering, drilling and swearing. Yes, it’s nice that he has extended the stable and made a nice cosy corner for me – which is my house and nobody else’s house – and he has built a whole new L-shaped manger; and added a new roof to the food storage area; as well as dozens of other jobs, like fence repairs and a new scratching post for us. But his constant manic activity has worn me out. Why the rabit can’t just stand around and gaze into space doing nothing, I really don’t know. I can manage it perfectly easily. 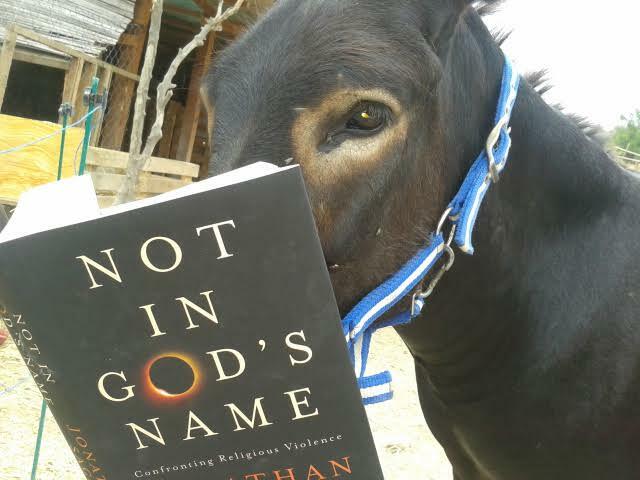 Now that the rabit has gone back to his teaching job we have finally got hold of his holiday reading book “Not in God’s Name” by Rabbi Jonathan Sacks. Morris is spending the day reading it to me. As you may remember, Morris does reading but not thinking and I do thinking but not reading. So far Morris has managed to read it to me quite well, although he did stumble slightly over the phrase “altruistic evil”, and he paused to ask me what it meant. I told him he didn’t need to know because I was doing the thinking and he could just carry on reading without thinking, as that usually works quite well enough. The main question is why people do bad things in the name of religion? I thought about doing a review of it, but evidence suggests people don’t actually read book reviews by donkeys. If you want to read an excellent review of it, the one written by Professor John Charmley is guaranteed to give you a good thinking day like the one I’m having. Of course, you can also do bad things without doing them in the same of religion. For example, when Aitana kicks me for no good reason, or stands in my place in the new stable extension – which is my house and nobody else’s house – or gets to the manger before me and tries to block me or shove me out of the way. That’s not because of religion, that’s because Aitana is a norty little fat horse. So we have to bring some discernment to these weighty matters and not think all rood and norty things are done in God’s name. OK, Morris: carry on reading to me please. We’ll have a nice quiet thinking day while the rabit’s at work. He said it was a “planning and preparation day”. What sort of thinking Tuesday is that? I’ll bet he’s not doing very much planning in his classroom anyway. Prolly just wasting his time on the computer. Oh dear such ungrateful donkeys!!! I take everything Rubí writes on my blog with a pinch of salt. We need to take into account that she is constantly irritated by flies and it is difficult to be grateful in those circumstances. She prolly sees the flies as my fault.